More like bird of the month at the moment, I regret. Slovakia is famous for its raptors so they, along with owls and woodpeckers, were my primary target there with my sister Gillian in June. We did get to see the most interesting ones: Eastern Imperial Eagle, Golden Eagle, Lesser Spotted Eagle, and Saker and Peregrine Falcon, but they were very shy and I had little success with their photography. I suspect it was because deer hunting is popular there – we saw many hides used by hunters – but perhaps also because it was the breeding season. Ironically, I had more luck with raptors when we returned to Ireland. When I was a teenager there in the 1960s, Ireland was probably one of the worst countries in the world for raptors. All the larger and mid-size ones (Eagles, Buzzards, Harriers, etc) had been exterminated in the 19th and early 20th century, and some of the smaller ones like Peregrines and Sparrowhawks were rare as result of widespread use of pesticides such as DDT, the Silent Spring phenomenon. So the Common Kestrel was the only species that one saw regularly. Things have improved since as a result of the banning of the most persistent pesticides, the re-introduction of some species and natural recolonisation by one species. 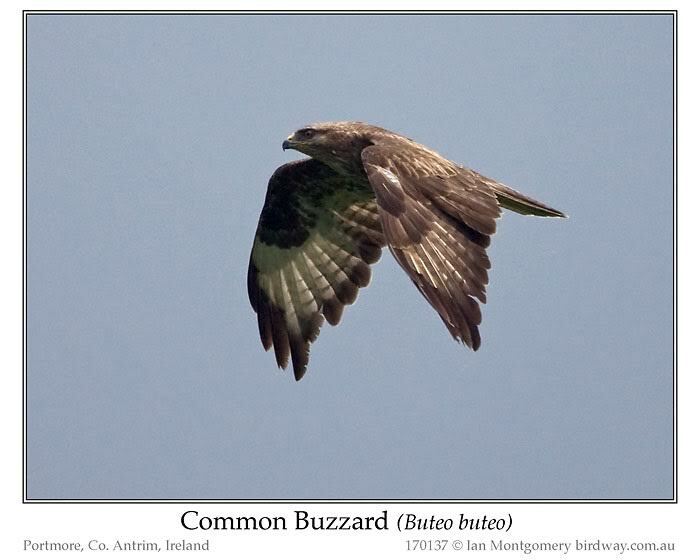 I’ll deal with a re-introduction next time, but here is the recoloniser, the Common Buzzard which became extinct in Ireland in 1891. It recolonised Rathlin Island on the far north coast of Ireland twice, once in the 1930s and again after it became extinct a second time as the result of the myxomitosis rabbit-killing epidemic in the 1950s. Rathlin Island is a mere 30km/20miles from the Mull of Kintyre in Scotland, no distance for able-bodied young Buzzards in search of a territory. Rathlin Island is also about as far as you can get in Northern Ireland from the Irish Republic, where strychnine was legally used to poison ‘pests’ by sheep farmers until it was outlawed in 1991. 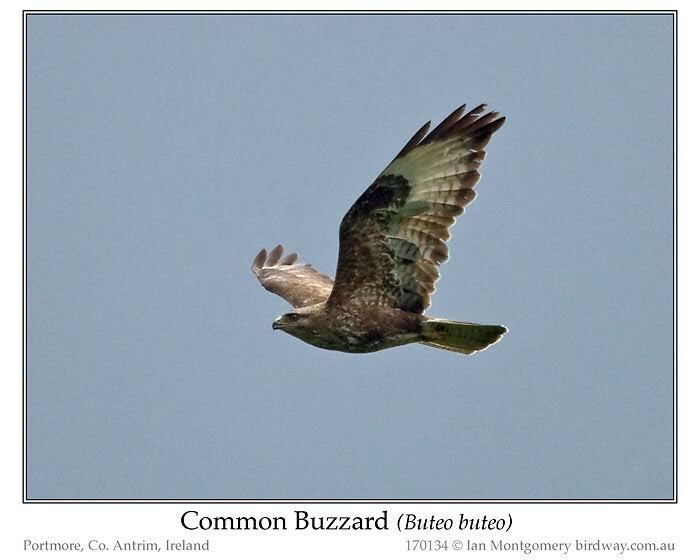 Far be it from me to jump to conclusions, but it seems a huge coincidence that the subsequent spread of the Common Buzzard to almost the whole of Ireland didn’t start until the 1990s and continues to this day. I saw my first Irish one in 1994 in Co. Louth just south of the border with Northern Ireland. Since then, its range extension has been spectacular. It is now, if not the commonest, certainly the easiest raptor to see in Ireland either soaring over fields or perched on light poles near Motorways. In 2015 it bred in at least 18 of the 32 counties. It is still uncommon in the west of Ireland, west of a line from about Sligo to Cork, though I did see one in Bantry, West Cork on this trip. The bird in the photos did, unlike its Slovakian counterparts, an obliging fly-past when we visited the RSPB reserve at Portmore Lough. This was on the day after our return to Ireland, when we were staying with cousins at nearby rural Ballinderry in Northern Ireland. Portmore Lough, better known for its wildfowl and nesting Common Terns and Black-headed Gulls (they nest on the floating platform provided for their benefit, just visible behind the reeds in the photo), is an interesting place in its own right. It’s a shallow, almost circular lake perhaps 2km across and about the same distance from Lough Neagh, the largest lake in Ireland. Rumour has it that it was formed by an air-burst meteor or a meteorite about 1500 years ago. Actually, the real reason for my trip to Europe was not raptors or Slovakia but the marriage of my sister Gillian’s son Ian at Huntington Castle in Co. Carlow to his fiancée Sinéad. Huntington Castle was ‘rebuilt’ in 1625, captured by Oliver Cromwell in 1650. It is, presumably, the subject of an ancient tune by the same name (I have a copy of a Scottish version dating from 1795) that I knew already from as a duet that we play on recorders in Townsville. 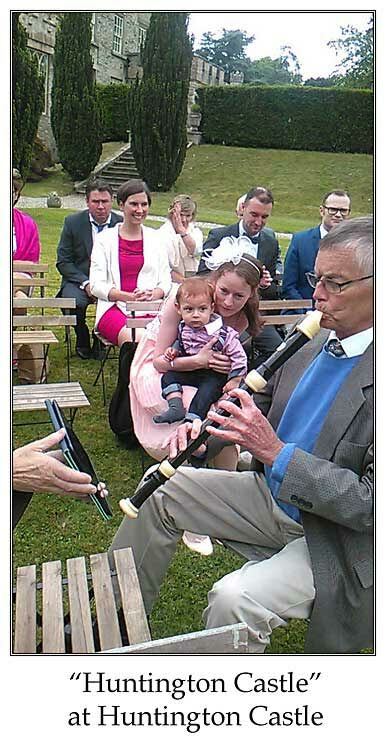 The photo shows me playing it on a tenor recorder during the signing of the register and being watched very intently by my one year old great-nephew Loïc sitting on the lap of his mother Jeannine, one of nephew Ian’s two sisters. His other sister Elyena took the photo and my sister Gillian is holding the sheet music in the form of my iPad, a great family occasion. What has Huntington Castle to do with Buzzards? Well, just as the celebrant was starting the ceremony and saying that the wedding date was the sixth anniversary of the couple’s meeting, a pair of Common Buzzards circled very deliberately just overhead. I, naturally, took that as a sign of a natural blessing on the wedding and like to think of the pair of birds as a totem of the married couple. Birds are frequently totems in Aboriginal Culture and, as I write, it is currently NAIDOC week in Australia, a time to celebrate Aboriginal and Torres Strait Islander history, culture and achievements. Not exactly sure why Ian added the third picture twice in his newsletter, but I deleted it. If he later updates it, I’ll correct this one. Anyway, seems as if Ian has been having too much fun lately. As he said, his Bird of the “Week” is turning into the Bird of the “Month.” I totally understand, so, he is off the hook, as far as I’m concerned. Nice article and glad you got to attend the wedding. Thanks for the photo of you playing your recorder. 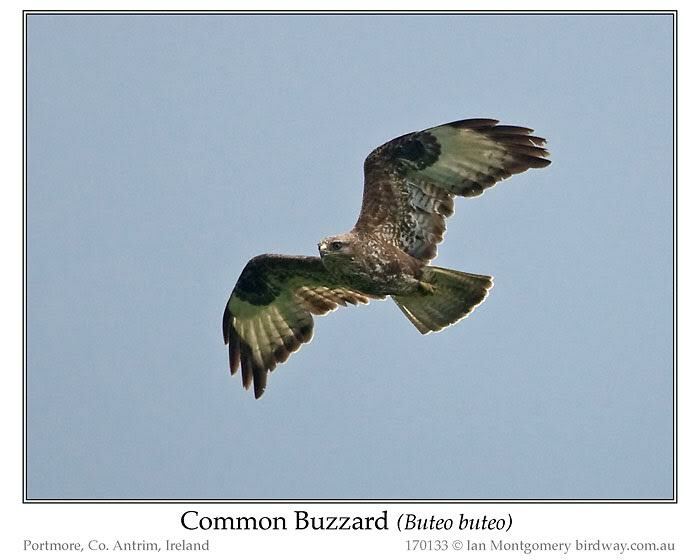 The Common Buzzards were of course great as usual. Here’s one for the wader enthusiasts: the Common Redshank, well ‘common’ in Eurasia and rather rare in Australia. It occurred to me when I was photographing these birds in Ireland in September, that, for birders, the appeal of a particular species is very dependent on location. Common Redshanks are noteworthy in Australia (I remember looking quite hard before finding one in Broome) but perhaps a nuisance in Ireland because they’re ubiquitous, nervous and noisy and often put more unusual waders to flight when you least want them to. The one in the first photo is foraging at low tide in the harbour at Carlingford Lough, an attractive bay between the Republic and Northern Ireland on the east coast and overlooked on the northern side by the Mourne Mountains. The two in the second photo are feeding in the mudflats in the estuary of the River Boyne some distance downstream from where the famous Battle of the Boyne took place in 1690. The bird on the right has just taken a tiny crab. The birds in the first two photos are in non-breeding plumage. Some wader species undergo spectacular colour changes when breeding, but in the Common Redshank the markings just become more pronounced, as in the third photo, taken in Portugal in the month of June some years ago. 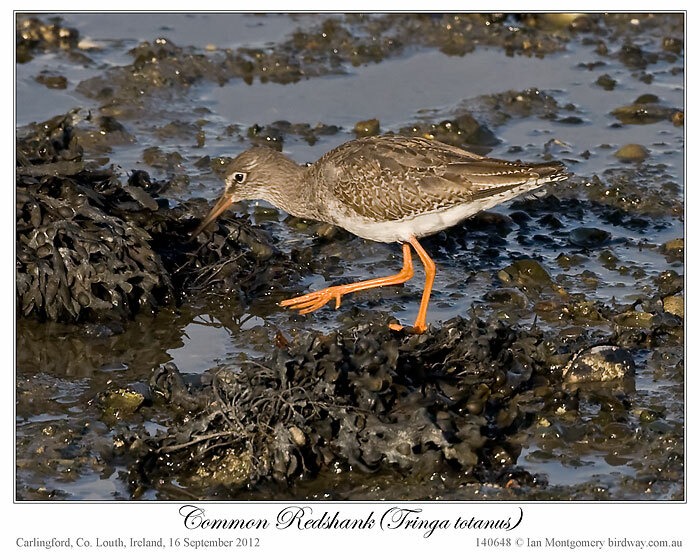 The bright red legs, or shanks, make this a relatively easy wader to identify. It’s ringing call is also distinctive and it shows a characteristic wing pattern in flight with white panels on the rear edge of the wing, as in the fourth photo, quite different from the wing bar or plain wing of most waders. The generic name Tringa is from the ancient Greek trungas ‘a thrush-sized bird mentioned by Aristotle, not further identified, but taken by later authors to be a sandpiper, a wagtail or a dipper‘. That’s equivalent to saying that this fruit is either an orange, a pineapple or a banana. And totanus comes from the Italian name totano for a Redshank. Sometimes the derivation of scientific names is informative, sometimes less so. What a neat little bird. 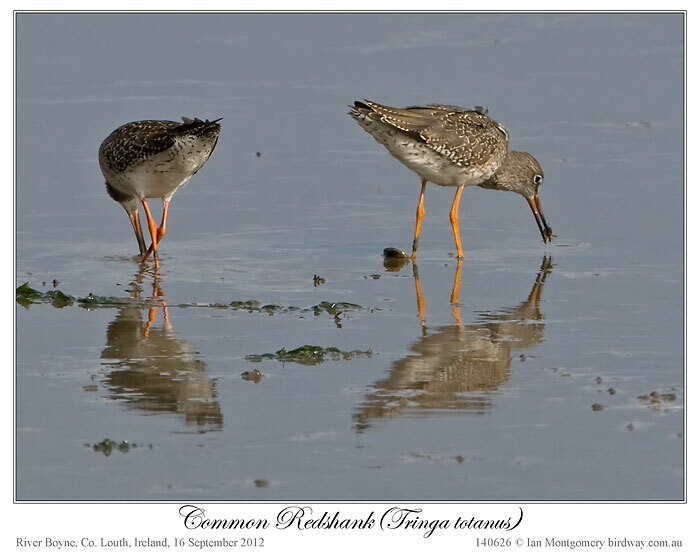 I especially like the 3rd photo showing the red, hence, Redshank. Thanks again, Ian. 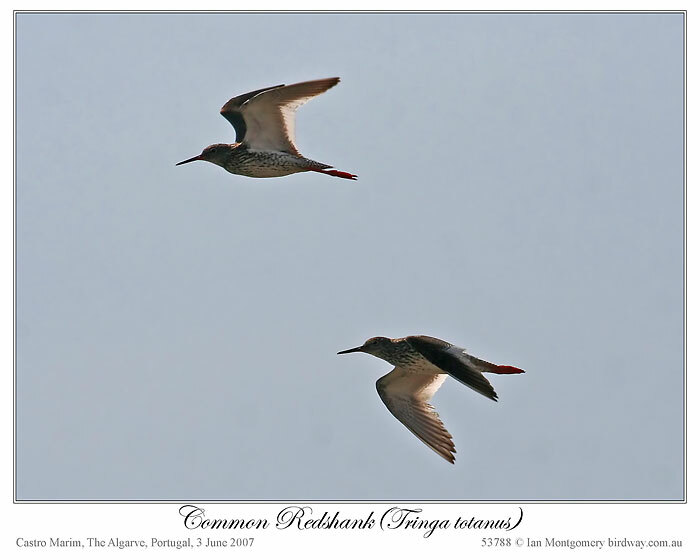 Redshanks do belong to the Scolopacidae – Sandpipers, Snipes Family. See his Scolopacidae family photos also. 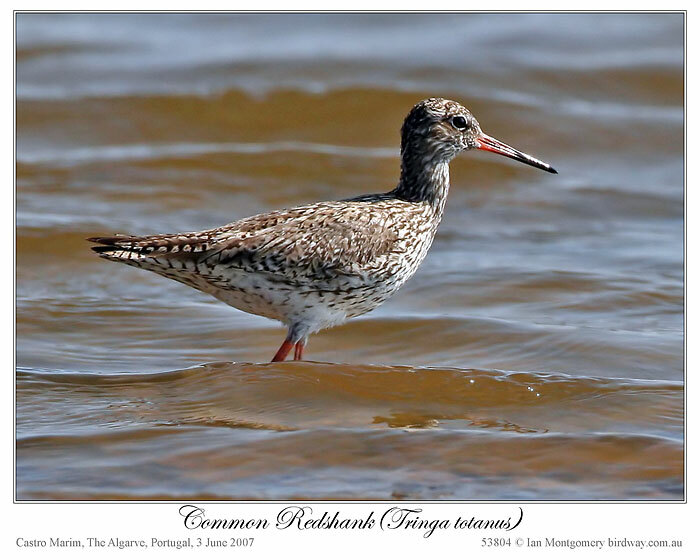 Common Redshanks in breeding plumage are a marbled brown color, slightly lighter below. In winter plumage they become somewhat lighter-toned and less patterned, being rather plain greyish-brown above and whitish below. They have red legs and a black-tipped red bill, and show white up the back and on the wings in flight.